When planning for my babies arrival, one thing I spent a lot of time thinking about was how I would decorate his nursery. I have always loved the idea of creating a cute, clean little space for a baby to grow up in with lots of nice colours and calming scenes -I love the idea of a babies bedroom being a happy & playful, calming and chilled out space. While browsing various websites for ideas, I soon came across lots of Wall Decal stickers and - as somebody who is as far from artistic and hands-on with decorating as a person can possibly get! - these instantly appealed to me. I discovered http://www.enchanted-interiors.co.uk/ website and was instantly smitten - as soon as you hit the home page you're instantly drawn in by the pretty, soothing pastel-coloured images. Enchanted Interiors sell a wide variety of Wall Stickers so there are lots of designs to choose from to fit in with pretty much any theme you can imagine! From Fairy Princess and Butterfly designs for pretty feminine bedrooms to Outer Space and Trains designs for cheeky boisterous bedrooms - every taste is catered for! I particularly love the Pirate Treasure Hunt stickers! As well nursery stickers, Enchanted Interiors sell many other items to spruce up your childs bedroom - once you have chosen your theme you'll be spoiled for choice with their range of matching acrylic mirrors, lighting, canvas prints, rugs and much more! I was thrilled to be given the chance to have a look at Enchanted Interiors Giant Fabric Wall Stickers for myself. I love the colours in the design, and think this would look just lovely against a white or baby blue painted wall. I particularly love the little swing on the branch with mummy & baby bird perched on it - SO cute!!! The stickers arrived a few days ago, I was really impressed with the packaging - they were sent in a really handy little tube which kept them perfectly safe in transit and has meant that they haven't been getting in the way while they're waiting to be put up as they're so compact! The stickers were sent with detailed instructions, which showed an image of the final design along with numbers showing where each piece should be placed - how easy is that!?? The quality of the stickers is really impressive, the colours are really striking and the design is absolutely flawless. 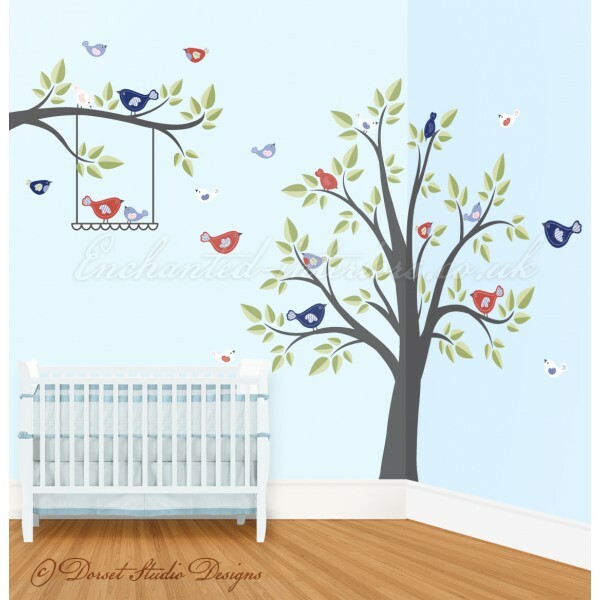 The Singing Birds In A Tree And Branch Fabric Stickers are available from Enchanted Interiors for £120.00 and with prices for wall stickers starting from as low as £12.55 there is something for every budget. And what's more, the lovely people at Enchanted Interiors are offering an EXCLUSIVE DISCOUNT CODE for Sparkles & Stretchmarks readers giving you 10% off Fabric Wall Decals until 31st May 2013 - just enter the code SASBR13 at the checkout to take advantage of this great offer! Ahh this looks amazing! I want something similar for our nursery!